An Ignominious Chapter Ends As 'Kate Plus 8' Is Reportedly Canceled TLC has apparently canceled Kate Plus 8, bringing to a close the chapter of our history involving the televising of this particular unfortunate family. 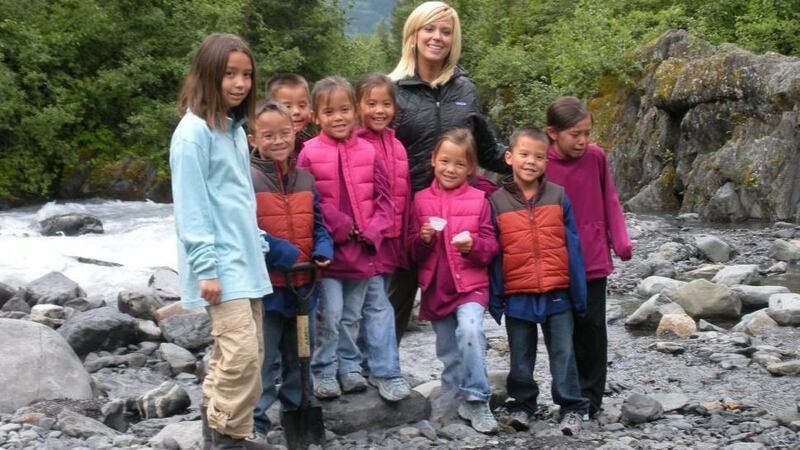 Kate Gosselin and her children are seen here during their trip to Alaska, where they met Sarah Palin and family. TLC has reportedly canceled Kate Plus 8. There's not a whole lot to say here other than that People is reporting that Kate Gosselin's show, Kate Plus 8 -- which used to be Jon & Kate Plus 8 and perhaps before that Gladiators Eaten By Lions While You Eat A Turkey Leg And Laugh, Ha Ha Ha — has been canceled. You may recall the gruesome turn of events in which Jon/Kate/8 began as a warm chronicle of an oversized family, then spun out into the train wreck of an obviously miserable marriage, then mutated into an unwatchable ... well, stink bomb that tracked an ugly divorce. When Kate Plus 8 returned (Jon Gosselin having been exiled to the Ed Hardy store and the pages of an imaginary magazine called Ugh That Guy Weekly), TLC tried to sell it as a spunky single-mom-triumphs-over-adversity story. Kate certainly did all she could to give herself an image makeover, swapping her trademark "floppy in the front, gnawed-on in the back" hairdo for flattering extensions and appearing on Dancing With The Stars -- an appearance about which the less said, the better. But it was not to be. All good things must come to an end, but it turns out bad things must come to an end, too. Adios, Kate Gosselin. My advice: Keep the extensions.